This post was sponsored by Ford and their new You Tube series, Switch It Up! I’m always thinking about ways to challenge myself, try new things and have new experiences. After all, how boring would life be if you played it safe and always stuck with what you knew?! I really spend a lot of time thinking about this — how to shake things up, make life as interesting as possible, and how to not fall into a monotonous routine. In fact, I consider routine the enemy of adventure. But that doesn’t mean you can’t live a structured life, work a job with traditional hours, and enjoy a schedule — it’s just a reminder to seek out and find joy in spontaneity, new tastes, sounds, smells and sights whenever you can. For example, it can be as simple as trying a new cuisine, conquering a challenging hike, or finally taking a class in a subject you’ve always been interested in. But with the busy lives we all lead, that’s all easier said then done. Just last week I got to know a new YouTube series called Switch It Up, in which experts challenge each other to try something new and get out of their comfort zone, and it got me thinking even more about shattering comfort zones, trying new things, and how I could encourage other people to try something new. So while I’m always trying new things and I hope they inspire you to do the same, I decided to write a little anti-comfort zone manifesto. An ode, if you will, to the importance of trying new things. But before you keep scrolling to read that, check this week’s episode of Switch It Up! to see online talk show host Chase Jarvis challenge Erica Domesek of PS I Made This to get out of her comfort zone and learn a few key hosting and interviewing skills. 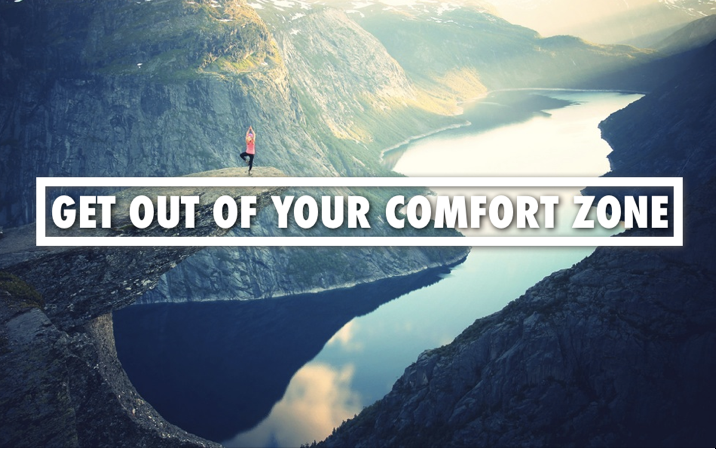 The feeling of being outside your comfort zone is something all humans experience at one point or another. But from the time we’re babies, we’re taught to fear that which is beyond your comfort zone. What’s out there? Is it scary? Is it dangerous? Better play is safe. How boring! This conditioning causes us to be cautious, which of course can be a good thing when it comes to protecting our physical well-being. However, that sense of cautiousness often infiltrates the non life-or-death decisions we make on a daily basis. That sense of cautiousness, or fear aversion, takes over and we begin making decisions based simply on how comfortable they make us feel — and thus, we rarely, if ever, reap the benefits that exist beyond the walls out comfort zone. Choice 1: Stick with what you know. Resulting Feeling: All warm and fuzzy inside. Choice 2: Step outside of what you know. Resulting Feeling: Emotionally tested and perhaps sick to your stomach. I love Choice 1, and with a Resulting Feeling like that who wouldn’t? However, I’ve become a junkie for the Resulting Feeling of Choice 2. Maybe it’s like becoming addicted to skydiving — you almost wet yourself out of fear before you step out of the plane and then once you reach the ground you discover that you’ve never felt more alive. I had my first “skydiving” experience shortly after I turned 18 when I chose Choice 2 and decided to postpone college and volunteer internationally. I wanted to be challenged, to be tested and to experience something new — but nothing could prepare me for arriving in New Delhi, India (on my way to Nepal) alone and at night having never traveled completely alone. Was it scary? You bet it was. But it broadened my horizons and made me realize that I was capable and unrestricted by fear. Nothing could have prepared me to arrive in Kathmandu, Nepal during political unrest, to live in a brick hut with spiders the size of my hand and to work in an orphanage with 45 children as their primary care giver. Was it scary? Yes. But it broadened my horizons and made me realize that I was strong and flexible. Those are just a few personal examples. For the sake of your time, I’ll leave out the 2 months that followed volunteering in Kibera, Kenya (Africa’s largest slum located in Nairobi) and rural Tanzania — as well as the countless fear inducing moments I’ve found myself in in the years since. Now allow me to clarify. I’m not suggesting that Choice 2 should always be chosen and that everyone should blindly throw themselves into the wind — just consider it. It’s also important to note that decisions don’t have to be big, they don’t have to be life changing and they don’t have to involve going to the other side of the world. The key is to make decisions that will test you, expose your weaknesses, and as a result, allow your strength to emerge. So remember: Make decisions that will allow you to learn about yourself, that’ll help you discover all that you’re capable of and that’ll show you that the only chains holding you back are the ones that you’ve placed there yourself.